Signed acid mark "Waterford" and Seahorse label. Beautiful Royal Brierly footed bud vase, in very good condition. This listing is for Eight Wine Glasses 'Tweed' By Edinburgh Crystal 1993-1998 Dimensions Glass Height ~ 17.2 cm (84/5") Glass Top Diameter ~ 7.3 cm (27/8") Description 'Tweed' is a superb pattern of 'fans'. This is an ideal large set of eight glasses to add to your suite of crystal. Please look at the attached photographs which form part of the description. Two Crystal Cut Glass Champagne Flutes. Fan and criss cross pattern with 16 point star to the underside of the foot. Royal Brierley Crystal Millenium 2000 Champagne Flute 12", New, with Original Sticker and Signed. There is a music score around the bowl of the glass for the tune of Auld Lang Syne. 2 X STUNNING ROCKINGHAM CRYSTAL LARGE WATER / WINE GOBLETS BNIB ! HERE WE HAVE 2 X STUNNING ROCKINGHAM CRYSTAL LARGE WATER/WINE GOBLETS, NEW & UNUSED IN THEIR BOX. A delightful pair of crystal brandy glasses with cut floral decoration. Etched lion rampant mark on the feet. I have been unable to identify this mark, (suggestions would be welcome) but the design is similar to the Stuart 'Cascade' pattern.12.5cms x 9cms widest. In perfect condition, no chips, cracks or scratches. This listing is for Ten Champagne Flutes 'Glenshee' By Edinburgh Crystal pre c.1980 Made in Scotland Dimensions Glass Height ~ 16 cm (63/10") Glass Top Diameter ~ 6.4 cm (21/2") Description It is unusual to be able to offer such a large set of ten matching Champagne Flutes. Ideal for all those celebratory events which are just around the corner. Glenshee is a superb pattern of diamonds with an upper border of three point 'fans'. A lovely gift for a wedding or an anniversary. Champagne - the most evocative of all wines. How can it be a celebration without the delicate flavour and tickly bubbles which makes Champagne the ultimate in toasting wines? This is the perfect shape for serving a superb bubbling Champagne. The perfect drink for your celebration. Please look at the attached photographs which form part of the description. Waterford Crystal Lismore Small Electric Bedside Lamp Signed Height ~ 12"
Waterford Crystal Lismore Small Electric Bedside Lamp. Height ~ 12" total including fitting. These are stunning glasses by Edinburgh Crystal pattern number ED191. A pair of hand made crisply cut crystal large water goblets or wine glasses. With beautiful vertical and cross cutting on the bowls, elegant baluster knop stems and star cut foot. This Listing is for Eleven Grapefruit / Dessert Dishes By Stuart Crystal c.1955-1994 Signed Dimensions Height ~ 6.5 cm (23/4") Top Diameter ~ 10.4 cm (4") Description This is a superb set of heavy weight dishes. Woodchester is a fascinating silky smooth pattern which is the perfect foil for the deep sharply cut 'Fern Leaves' on each dish. This is an ideal dish for serving a wide variety of desserts, berries, individual trifles, creams, etc. My preference is for a rich chocolate mouse with brandied cherries hidden at the base. Ironically this shape was probably originally intended for serving a half grapefruit at the breakfast table. This is a good large set of eleven dishes allowing you to seat ten at the dinner table and have a dish aside as a spare. A superb addition to your 'Woodchester' suite of Crystal. One of a Limited Edition of 50 Champagne Flutes made by Bob Crooks in 1998 - signed Bob Crooks. (it looks like No. 17, but it could be 13, see pic). Bob Crooks Limited Edition (of 50) Champagne Flute. One Edinburgh Crystal Champagne Flute in the Beauly Pattern. Marked “Edinburgh Crystal” on the foot. HERE WE HAVE A VERY CONTEMPORARY EDINBURGH CRYSTAL 'ROSLIN' DOUBLE OLD FASHION WHISKY GLASS NEW, SIGNED & BOXED. THE BASE IS ETCHED.. EDINBURGH. 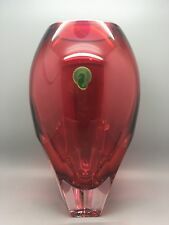 Large wheel cut, art glass vase. Purple/Lilac. The first thing that caught my eye about this vase, was the incredible colour. When you finally see how the colours are made up?. You find tiny striations of the very vivid colour running all the way through, (Similar to Birtil Vallian, Kosta Boda Minitures). SET of 2 X EDINBURGH CRYSTAL LOGAN CHAMPAGNE FLUTES (Rare) NEW & BOXED! HERE WE HAVE A SET OF 2 X EDINBURGH CRYSTAL LOGAN CHAMPAGNE FLUTES, Signed, NEW & BOXED. THE STYLE OF THE BOWL IS VERY SIMILAR TO 'APPIN'. THE BOX ITSELF IS IN 'good' CONDITION & INCLUDES A SMALL GIFT CARD. This listing is for Three Large Tumblers / Glasses 'Arundel' By Stuart Crystal c.1979-1984 Dimensions Glass Height ~ 9 cm (31/2") Glass Top Diameter ~ 8.4cm (31/4") Maximum Capacity ~ 10 fl oz Description This is a rare Set of 'Arundel' Tumblers. 'Arundel' is a superb very popular Stuart pattern. Smooth polished panels form the lower border whilst laurel leaves form a classical upper border. Please look at the attached photographs which form part of the description. This listing is for a Pair of Goblets 'Eclipse' By Edinburgh Crystal Dimensions Top Diameter ~ 6.4 cm (21/2") Height ~ 24.5 cm (93/4") Maximum Capacity ~ 14 fl oz Description These are superb quality heavy crystal Goblets in the rare Eclipse pattern. Eclipse is a dramatic pattern of 'rings' set at an angle and cut deeply into the crystal. Minimalist, striking and elegant. I will be listing several 'Eclipse' lots including a second boxed pair of goblets. Shipping discounts may be available. Please look at the attached photographs which form part of the description. Waterford Crystal bring you this beautiful pair of Tall Beverage glasses in the Clear Light pattern. This Listing is for Six Champagne Flutes 'Clova' By Edinburgh Crystal 1997-2000 Made in Scotland Dimensions Height ~ 22.6 cm (89/10") Diameter Top ~ 6.7 cm (25/8") Please note as with all hand made crystal the sizes will vary slightly. Description These are excellent high quality heavy weight glasses and will be a fabulous addition to your suite of Crystal. Champagne - the most evocative of all wines. How can it be a celebration without the delicate flavour and tickly bubbles which makes Champagne the ultimate in toasting wines? This is the perfect shape for serving a superb bubbling Champagne. The perfect drink for your celebration. 'Clova' is a superb modernist pattern of slim vertical lenses. Such an elegant design which reflects the light beautifully and offers a fabulous silky smooth yet confident handhold. This listing is for a Set of Six Straight Sided Old Fashioned Whisky Glasses 'Ayr' By Edinburgh Crystal Made in Scotland Firsts Dimensions Height ~ 8.3 cm / 31/4" Diameter Top ~ 8 cm / 31/8'' Max Capacity ~ 10 fl oz Description 'Ayr' is a superb pattern of fans, swag and cross hatched sections. This is the perfect large glass for serving whisky on the rocks or with a mixer. A great gift for a whisky Connoisseur. Please check out all the many great photographs attached to this listing. A very good quality set of cut crystal wine glasses produced in Britain as they have rounded rims. Continental glassware generally has a flat rim. Type: Millennium champagne glasses. Size: 21.7cm. This listing is for a Champagne Flute (There are up to nine Flutes available to the first buyer only) "Highland" By Edinburgh Crystal Made in Scotland pre c.1980 Dimensions Height ~ 16 cm (61/4") Diameter ~ 6.3 cm (21/2") Description This is a superb Champagne Flute in the very popular 'Highland' pattern, with up to nine glasses available at the time of listing. 'Highland' is a superb pattern of elongated vertical lenses interspersed with a large 'cross' section. This is a very tactile pattern and gives the glasses a great grip in the hand. Flutes will be a superb rare addition to your suite of 'Highland' Crystal. The perfect glass for serving Champagne, the most evocative of wines for the very best of times. BEAUTIFUL CRYSTAL CHAMPAGNE COUP GLASS Waterford ?. Type: Julia tumblers. Rare in this larger size, normally found in the small 3" - 5oz, these would be 8oz. Size: 9.3cm. They have decided they simply don't like the item. WATERFORD KATHLEEN SHERRY GLASSES . SHERRY GLASSES IN THIS SUITE ARE 4 1/4" TALL. Kathleen: ONE OF WATERFORD'S RARER SUITES. Waterford" IN THE OLD MARK. Here is a beautiful heavy glass candle holder with a modern classic design, made by Waterford for their Marquis range. Nearly all our goods are sold as used or previously owned, unless listed otherwise. This variation of the Clarendon pattern features the brilliance and clarity of crystal with a dramatic pop of exciting colour. Waterford was established in the heart of the Irish harbour town of Waterford in 1783. Tankard 7.5 cm high.lovely condition. TYRONE HOCK GLASSES. Signed "Waterford".